Read Aloud Thursday is something I've been meaning to participate in for weeks. I keep leaving the titles of the books we've read aloud in the comments over at Hope Is the Word. This week, no excuses. Here's what we've been reading this week. Elliot's bedtime routine includes reading four books. This number is flexible but it never goes below four. Last week it was all about the free Thomas the Tank Engine books that came free with the (terrible) paper, but we've been trying to wean him off them. 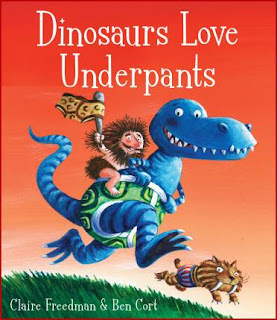 Dinosaurs Love Underpants by Claire Freedman and Ben Cort. Elliot went through a phase of liking dinosaurs. Now he thinks they're scary and says 'I don't like die-shoe-aurs' but this book makes him giggle instead of be afraid, so it's still allowed. This book explains the mystery of how the dinosaurs became instinct. Elliot likes the illustrations as well as the rhyming text. 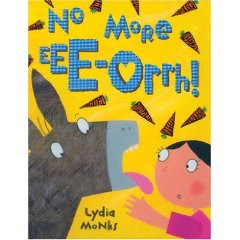 No More Eee-orrh! by Lydia Monks. 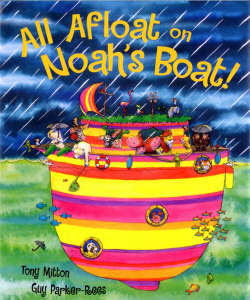 This is possibly my favourite picture book of Elliot's. I'm a fan of donkeys anyway, but in this Lydia Monks has taken real photos of donkey fur (fur?) and used it alongside cartoon illustrations in this tale (tail!) about a noisy donkey and his neighbours. 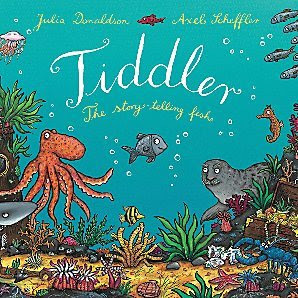 Tiddler by Julia Donaldson and Axel Scheffler. Who doesn't love Julia Donaldson? Elliot adores all of her stories. Especially when she teams up with Axel Scheffler. His favourite part of Tiddler? Pointing out the 'Gruffalo fish' and yelling 'Tiddler? Tiddler? Tiddler's LATE!' The rhyming repitition of this book which makes it all a bit sing-songy really appeals to my three year old. Oh, Michelle, I'm so glad you finally "officially" played! All of these look fabulous! I especially like the last two--I'm going to have to check and see if any of our local libraries have any of these. I've never even heard of Julia Donaldson, but it sounds like she's a not-to-be-missed author! Thanks again for playing, and I look forward to the future weeks! Have you read him "Burnt Toast on Davenport Street", by Tim Egan? It's very quirky, possibly one of my favorite children's books. Anything by Hellen Lester is pretty great too - I miss babysitting sometimes, I don't get to read children's books anymore! Hillary - I've never heard of either of those books or authors. I think there's always a good excuse to read children's books if you think hard enough :) Weren't you writing a children's book in high school? Amy - I'm glad I played as well, it was fun. Julia Donaldson is by far my child's favourite author! You really must look out for her.